The majority of the requests brought before top Federal Motor Carrier Safety Administration officials at a public listening session on hours-of-service rules can be distilled into one desire: flexibility. 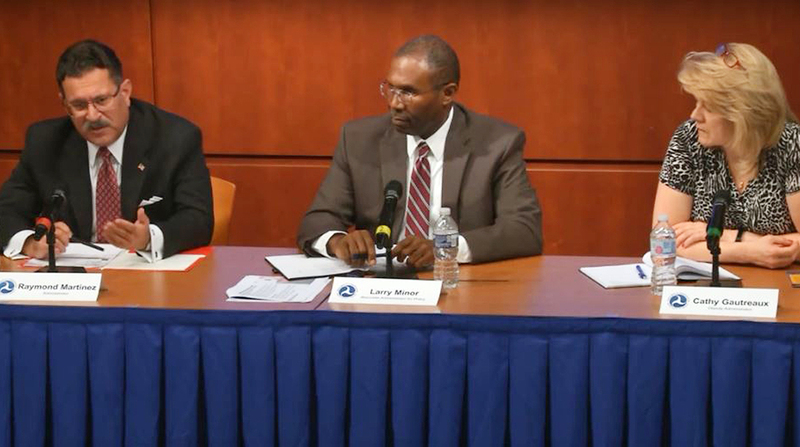 FMCSA hosted a listening session Oct. 10 to discuss potential changes to HOS rules. Participants had the chance to discuss the shorthaul HOS limit, the HOS exception for adverse driving conditions, the 30-minute rest-break provision and the split sleeper-berth rule to allow drivers to divide their required rest time in the sleeper berth. Owner-operators and association leaders representing construction workers, livestock haulers, movers and chemical distributors civilly peppered FMCSA officials, including Administrator Ray Martinez and Associate Administrator for Policy Larry Minor, with comments for the duration of the two-hour session, which was held at the agency’s Washington, D.C., headquarters. Current federal law mandates drivers take a 30-minute break after eight hours of driving. Many attendees — and even more online commenters — said they want flexibility in choosing the time and duration of their breaks. Tariq Robinson, a driver for Naomi Jeanette Robinson Trucking in Washington, D.C., said he feels confined by the 30-minute rest break requirement. He said 30 minutes offers scant opportunity for tasks such as cleaning his truck, examining tires and securing loads. Other participants argued for flexibility in splitting up rest breaks for drivers who operate sleeper-berth trucks. Allison Rivera, executive director of government affairs for the National Cattlemen’s Beef Association, said her trade group would support a program that allowed sleeper-berth drivers to split their rest time. For example, instead of resting for 10 hours straight, drivers could divide rest hours into 7/3, 6/4 or 5/5 splits. Rivera said that stopping for a 10-hour break with a trailer full of animals is not healthy for the creatures, which could be harmed by the elements and poor ventilation. She said a shorter break of two or three hours would be more tolerable for the animals and beneficial for the driver. A recent analysis from the American Transportation Research Institute supports this idea, suggesting that certain “innovative HOS concepts” could help drivers avoid congestion by taking strategic periods of rest. FMCSA asked industry representatives if the agency should expand the current 100 air-mile shorthaul exemption from 12 hours on-duty to 14 hours on-duty to be consistent with the workday rules for longhaul truck drivers. Nick Goldstein, vice president of regulatory and legal issues for the American Road and Transportation Builders Association, noted that shorthaul construction truck drivers generally drive far fewer miles daily than longhaul drivers. He said these drivers, who operate equipment such as concrete mixers and front loaders, frequently drive fewer than 20 miles per day. Not all participants supported increased flexibility. Harry Adler, public affairs manager at the Truck Safety Coalition, urged FMCSA to strongly consider safety implications before making changes to HOS rules. Franklin Wood, a father whose daughter died in 1992 on the road to college when a truck hit her disabled vehicle, said flexible rules allow “bad actors” more leeway to be reckless. FMCSA published an Advance Notice of Proposed Rulemaking on Aug. 23 concerning the rules. The comment period on the ANPRM garnered 5,021 online comments by the time it closed Oct. 10. The session marked the final chapter in a series of five talks FMCSA held to discuss possible HOS rule changes. “It’s important to remember that ANPRM is not presenting definitive regulatory text,” Martinez said. “[It] represents our opportunity to collect input, research and perspectives on areas where we’re considering potential changes."